This couldn't come at any better time, I'm currently revising and my brain in the morning needs to feel awake and alert and along with a good breakfast and juice to make sure that hunger is kept away, the mind needs to feel relaxed but alert enough to be able to absorb all that I need to soak up. To be fair, I'm never the type to take the morning and evening oils/teas etc into mind as I don't have a problem falling asleep as much as I use too, therefore to be honest I've used it in the morning and evening. 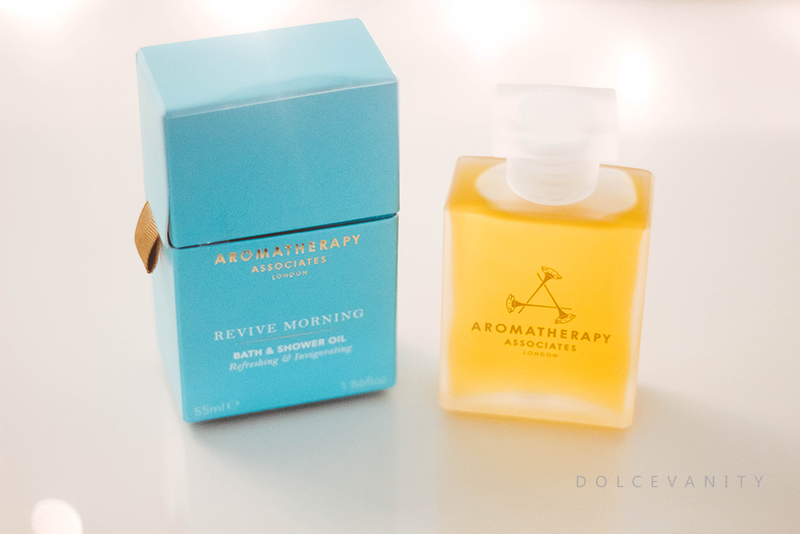 Revive Morning (55ml/£40) has some of my favourite key notes, Pink Grapefruit (which I could eat right now), Rosemary, Juniper Berry and Pine. Most of these ingredients are used for nervous disorders, anxiety and stress therefore I see it as a good way to not hate waking up being that it's relaxing and keeps you level headed. You'll also find coconut oil, mandarin oil, sweet orange oil, eucalyptus oil, geranium and peppermint oil within the ingredients. You can put a capful amount to your bath or over your body in a shower. I put half a cap and still found that there's benefits and the aroma is still potent. There is a high perfume scent but it's not overbearing and once in the water it becomes slightly milder. Also while in the bath and just washing that the back of my legs were quite oily, where the oil had most likely settled at the bottom but it's nothing that you can't rub and rinse off. The bath isn't left oily - which it shouldn't as there isn't that much oil. All in all, love this oil. Bath time is my favourite pass time and this added luxury is a winner.